Last year, comedian Jim Gaffigan and his writer wife, Jeannie, faced a health crisis that nearly ended her life, derailed their family, and halted his career. But innovative technology -- and a little humor -- got them through. Yes, Jim’s a famous comedian. 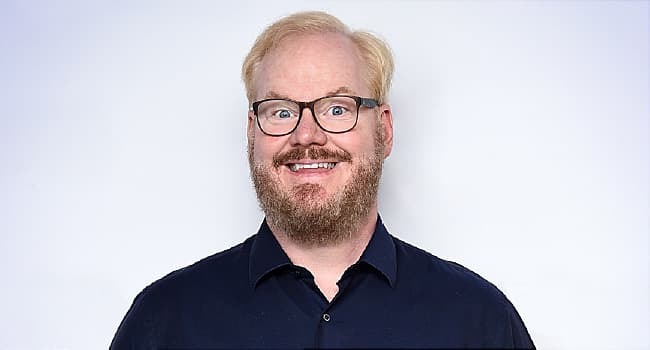 But ignore his film work, late night appearances, and standup gigs, and the Gaffigan family is like any other loving, if slightly frantic, large clan. Jim and partner Jeannie (in marriage and material -- she’s a writer, producer, and his frequent collaborator) together juggle five young children, joke-making, and insane schedules. And they do their best not to drop any balls, least of all when it comes to their health. So when Jeannie developed crushing headaches, frequent falls, and severe fatigue in the final months of 2016, she chalked it up to, well, life. The busy mom thought, I don’t have time for this! “I figured I had the flu,” she says. It was her kids’ pediatrician who first raised a red flag during a routine visit. That is, if you deem “routine” a single appointment last April with all five children, two daughters and three sons (now) ranging in age from 4 to 13, in tow. After noting her rattling cough, the doctor switched focus from the Gaffigan brood to their mother, who couldn’t hear much out of her left ear, either. An impromptu examination showed no obvious signs of inflammation, so she suggested Jeannie immediately see an ear, nose, and throat (ENT) specialist. She complied. And didn’t think much of it. She certainly never imagined she’d find herself about to be wheeled into major surgery a few days later, a frightened Jim at her side. It all happened so fast: The ENT ordered an MRI scan of Jeannie’s head, which revealed a 6-centimeter tumor the size of a tennis ball growing within the tightly contained space of her brain stem. While it eventually tested benign, its dimensions and location were particularly dangerous. Had it gone unchecked for even a short time longer, she would have had problems thinking and remembering, paralysis, and very likely death, according to her doctor, Joshua Bederson, MD, at Mount Sinai Hospital in New York. “We did tell our two older children what was happening because we knew the household was about to be disrupted dramatically,” Jim says in a phone call from his hotel room just a few hours before he performed a comedy set in New Orleans. “So we did to them what the doctors did to us: presented the information with a positive, glass half-full approach,” even if his true level of anxiety, he admits now, was off the charts. Both Gaffigans subdued their fears through countless prayers, an action plan that included checking into Mount Sinai’s emergency room after learning top surgeon Bederson worked there, and staying true to their shared modus operandi: being funny. “Jeannie came out of the MRI machine with new material, saying, ‘Hey, Jim! Write this down,’” the Cinco comedy special star recalls, his tone relaxed with hindsight. Fans of Late Night with Seth Meyers sampled this in Jim’s updated act, now replete with brain tumor jokes that were co-written by the patient herself. Kidding aside, Jim is the first to emphasize just how gutted he’d be without his other beloved half. He’s been known to call her his “secret weapon” for helping craft such punch lines, often inspired by hilarious moments pulled from family life. Choroid plexus papilloma is a rare and benign tumor that grows within the brain stem, a crucial region that controls the flow of messages between the brain and the rest of the body, as well as basic bodily functions such as swallowing, heart rate, blood pressure, consciousness, feelings of sleepiness, and even breathing. “The brain stem is what we call high-price real estate in neurosurgery,” Bederson says. “It’s chock-full of critical structures.” Patients with Jeannie’s condition generally first get pneumonia, he explains, because they have trouble swallowing saliva and food, which gets sucked into the lungs. Other symptoms include “loss of cranial nerves, speech issues, respiratory depression, loss of balance and functionality, painful headaches, debilitating fatigue, and weakness,” all of which Jeannie had. It’s unusual for someone Jeannie’s age to be diagnosed with this type of mass. The condition is more common in children and represents only 2% to 4% of all tumors in adults. But what made her growth so remarkable, Bederson says, was its “huge” size, a factor that immediately suggested it was likely not cancerous but still destructive. After seeing her first scan from the ENT, “I couldn’t believe she was able to walk into my office by herself, much less care for five children,” he says. Which is why he ordered her immediate treatment. Recovery, however, didn’t go quite so smoothly. The writer’s brain stem had endured so much compression from the tumor that her ability to swallow was still seriously weakened. The night following the operation, “I aspirated my saliva and developed double-lung strep pneumonia,” she says, which compelled Bederson to perform a tracheotomy to her neck to open up her airways, followed by the insertion of a feeding tube into her naval cavity. She relied upon both for months as she battled back from illness. Once stabilized about 2 weeks post-surgery, Jeannie returned home to the Gaffigans’ Manhattan apartment to recover. “Our youngest sons dressed up like doctors to care for her,” Jim says. “They showed so much compassion.” He chokes up a bit when describing how family members flew in from the Midwest “without hesitation” and how so many “amazing” friends from all walks of life appeared to help with the kids as she began speech and swallowing therapy and other rehabilitative work to restore her brain functionality, body strength, and balance. Jeannie still struggles with roughly 50% hearing loss out of her left ear and is only now, many months later, graduating from a liquid diet. But “her 60% is my 110%,” Jim told the San Francisco Chronicle last September of her rebound. “We have an instrument that knows where my [surgical] instruments are in relation to the patient’s anatomy,” he says. “We track the microscope’s movement and where the focal point of the microscope is, so the computer knows where my eyes are looking and where my eyes are focused. “If I want to know where the brain stem is when I’m working on a tumor, normally I wouldn’t be able to see it because the tumor’s [in the way]. Now you have control over the simulation. You can see around corners.” This provides neurosurgeons like Bederson a level of precision and safety previously more difficult, if not impossible, to achieve. Joshua Bederson, MD, professor and system chair, neurosurgery, Mount Sinai Hospital, New York. American Brain Tumor Association: "Brain Tumor Information."